The new technology buildings at Kalvskinnet are part of the university’s plan to centralise science, technology and teacher training on the one site. CCL provided the design of the post-tensioned flat slabs for this exciting new project, which has a total area of 16,000 m2. 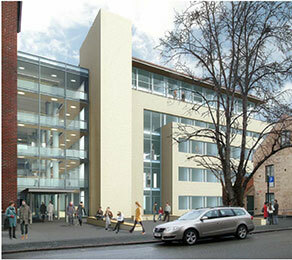 It comprises two structures: a 4-storey building and a 6-storey building, each with two basement levels. A glass roof links these new with the existing structures. There were several challenges on this project, including a tight construction schedule, polluted ground and a degree of subsidence in the original buildings. The latter, when combined with high loads, created challenges in the joints between the new and existing structures. Limited construction height and long projections for bearings to stairways further complicated the construction. CCL’s key objectives were to reduce the height of the structures in order to meet the requirements of local building regulations and to provide a solution that was economically cost effective. CCL’s flat-slab scheme reduced slab thickness from 265 mm to 230 mm, which maximised floor-to-ceiling height. The thinner slabs, combined with the integration of beams into the slabs, reduced the overall height of the building. The post-tensioning solution also significantly reduced construction time, which, combined with fewer and slimmer bearing structures, resulted in a significant financial saving on the project. CCL’s approach focused on delivering rational solutions and ensuring efficient planning. Both of which were key to the success of the project.